In 1911 the fashion designer Paul Poiret held one of his 'unforgettable' fancy-dress balls - 'The Thousand and Second Night'. He attired his wife in a 'lampshade' tunic over 'harem trousers', which subsequently inspired similar exotic creations, including 'Sorbet', comprising a skirt and tunic. Paul Poiret (1879-1944) was born in Paris. He opened his own salon after serving an apprenticeship for Douçet and working for Charles Frederick Worth (1825-1895), the English-born designer whose Paris salon dominated French couture. 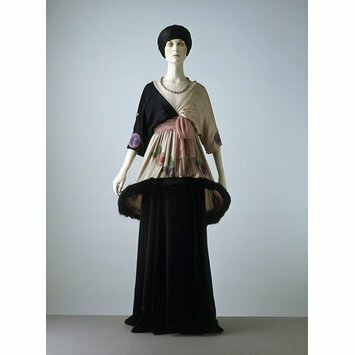 Poiret was one of the most creative fashion designers of the 20th century. He also revived fashion illustration, founded a school for the decorative arts and even diversified into perfume. He led the forefront of the artistic fashion movement away from the curvilinear silhouette of the early 1900s towards a longer, leaner line. His brilliantly coloured, looser clothes, often inspired by the 'orientalist' enthusiasm for Eastern fashions and traditions, were extremely popular. Black and white satin tunic with cross over bodice and elbow length sleeves, worn over a black satin skirt. The tunic is trimmed with large floral bead motifs in pistachio, pink and mauve (i.e. 'Sorbet' colours) designed by the Martine School and edged with fur mounted on a wire foundation. There is a pink chiffon sash with a bead fringe fastened at the high waist. The bodice is faced, but not lined, and has a wide grosgrain waist belt. The skirt has a pleated front and its trained back is of black satin. It has a grosgrain waist belt. 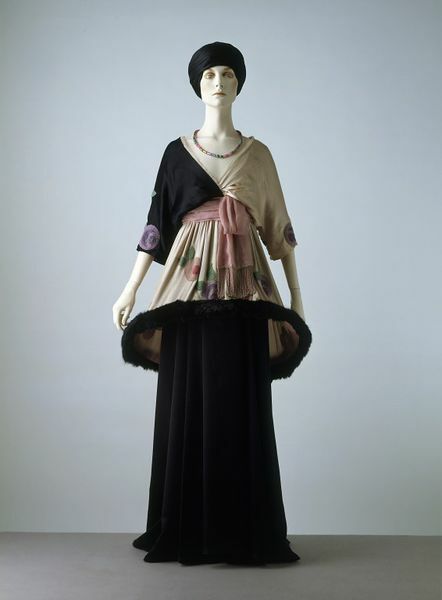 This dress was originally owned by Mme Boulet Poiret, Paul Poiret's wife. A note in the object history file remarks that the skirt is a remake, made for Mme Boulet Poiret as a copy of the original. It remarks the original skirt was 'canibalised' during the war. Other examples of the 'Sobert' dress are in the collections of The Chicago History Museum and the Museum at FIT.